Tokyo, July 17 2013 -- Hitachi, Ltd. (TSE: 6501 / "Hitachi"), Juntendo University and the Faculty of Medicine, Ramathibodi hospital, Mahidol University, Thailand, today announced that they have signed a memorandum of understanding (MOU) in relation to cooperation in area of healthcare, with the aim of facilitating exchange of medical personnel and technologies. The three parties will exchange information on research in advanced medical technology, training of medical personnel, and improving the efficiency of hospital operations through a global industry-academia cooperative relationship. In recent years, the number of patients in Thailand contracting communicable diseases has decreased due to widespread inoculation. On the other hand, the mortality rate of people dying from cancer and other diseases has been increasing since the 1990s. This trend has prompted a greater demand for training and increasing the number of highly skilled medical personnel who can provide preventive and medical care of these diseases as well as enhancing the medical environment. To fulfill this need, Faculty of Medicine, Ramathibodi hospital, Mahidol University has been promoting the exchange of personnel and technical cooperation with external institutions as part of its efforts to raise the level of medical care in the country. In Japan, Faculty of Medicine, Ramathibodi hospital, Mahidol University has signed an agreement with Juntendo University and the National Cancer Center in 2011, under which the parties are promoting cooperation in medical education and research. Juntendo University, also has a comprehensive agreement with Hitachi signed in 2012, under which the two parties are pursuing joint research for the early practical application of advanced technologies in the areas of medical care and healthcare in Japan and overseas. Under the agreement announced today, Faculty of Medicine, Ramathibodi hospital, Mahidol University will be able to further raise the level of medical care in Thailand by combining the extensive track record and expertise that Juntendo University has in medical care with Hitachi's medical technologies. 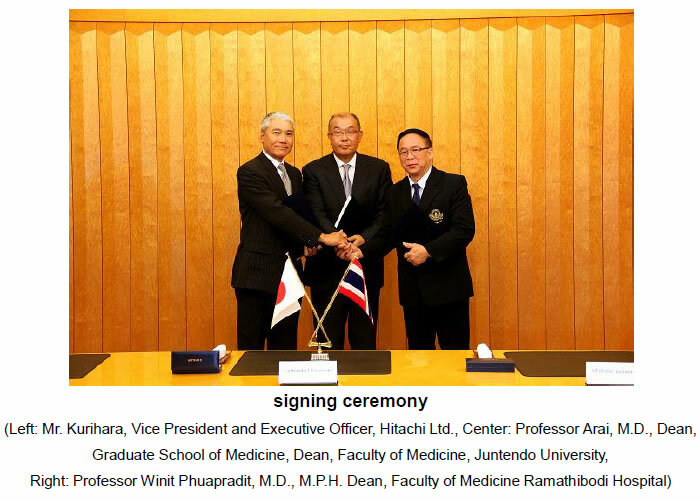 Juntendo University, through this increased exchange with Faculty of Medicine, Ramathibodi hospital, Mahidol University, will be able to further promote the globalization of its education research,and Hitachi hopes to gain knowledge on clinical settings in Asia to facilitate the global development of its medical equipment-related business and enhance its provision of healthcare solutions. Hitachi, Juntendo University and Faculty of Medicine, Ramathibodi hospital, Mahidol University will continue to discuss areas for collaboration in the healthcare field based on the MOU, and through this cooperation will deepen their respective expertise as well as, by promoting global collaboration with other universities and institutes, contribute to raising the level of medical care in Asia and the world. Juntendo University has a distinguished history spanning 170 years since its original establishment in 1838 as a medical school based on Dutch medicine in Edo Yagen-bori. The University is a general healthcare university with a School of Medicine, considered the original proponent of western medicine in Japan, the School of Health and Sports Science, which explores sports from a scientific perspective, and two schools of nursing. Further, the University serves the broad medical needs of the nation through its network of 6 university-affiliated hospitals with a total bed count of 3,199, the largest in Japan, and the formation of a strong network with domestic and overseas hospitals. The Faculty of Medicine Ramathibodi Hospital, one of the 2 medical schools belonging to Mahidol University and the fourth oldest medical school in Thailand, was approved in August 1964 under the Second National Economic and Social Development Plan (1964-1966). The faculty received major funding from the Thai government and financially and academically supports from the Rockefeller Foundation during its foundation. HM King Bhumibol Adulyadej graciously conferred upon the name of this new medical school "Ramathibodi" and laid the foundation stone for the building on December 30th, 1965. On May 3rd, 1969, the King came to open the new faculty. Since then the Faculty of Medicine Ramathibodi Hospital has been fully equipped and has provided medical education and services as well as research facilities to the public.